Weight loss is hard which is why we have the right solutions for weight loss in Johnson County KS. Our Metabolic Reset Program aims to get the results you want and stop making the weight loss mistakes thousands are still making. We don’t have a magic bullet, because we don’t need one. We understand how hormones, metabolism, fat burning and fat storage work to get the weight off and keep it off. This means no magic needed- just good science and the program that helps you understand how your body was designed to be fueled. Weight loss is more than just looking good in the mirror- it dramatically impacts your health. Having obesity increases the risk and rate of high blood pressure, diabetes, heart disease, cancer, and dementia. Because of rising healthcare costs, employers are moving and starting companies in areas with lower obesity rates in order to have a healthier workforce. This results in major cost savings from healthcare and employee missed days of work. The obesity rates we currently see began increasing when the nutrition conversation shifted in the 1950’s. This is when the bad science around fat causing heart disease began. This caused major shifts in nutrition messages, the food industry, and the foods consumed by Americans. Quality, nourishing fat sources were replaced by shelf stable fake foods containing mostly chemicals and sugar. Beginning in the 1950’s Americans begin filling themselves up rather than fueling their bodies. Despite aggressive efforts towards weight loss by many Americans, the obesity rates have tripled since the 1960’s and doubled since the 1980’s. In 1995 the average rate of adults with obesity was 10-15%. In 2016, this rate had climbed to 30-35% with some areas of the US with obesity rates over 40%. This is devastating for public health, but carrying excess weight may be keeping you from the health you need for the life you want. We are here to help. The sham science and misplaced political capital in the 1950’s-1970’s set the stage for American’s eating poorly and created the hormone imbalances we see today. When the nutrition message shifted to promote fat as the cause of heart disease, rather than sugar, the health of America began to decline. In the 1960’s the USDA nutrition guidelines changed nutrition history by putting carbohydrates on the bottom of the food guide pyramid promoting a diet of approximately 60% carbohydrates, 20% protein and 20% fat. These guidelines were not driven by nutritional science or even the medical community, but rather the political climate of the time. 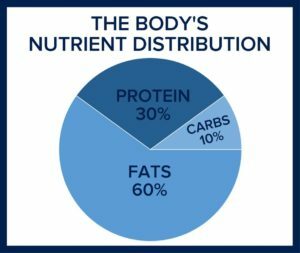 These nutrition guidelines ignored the body’s actual nutrient distribution that is actually closer to 60% fat, 30% protein and 5% carbohydrate. Foods were then created to fit this new American way of high sugar, high carbohydrate, low fat eating, which led to Americans eating primarily foods that cause hormone imbalance. The foods we have been taught to eat are foods that promote fat storage and dysregulate the body’s natural fat burning ability. This is why generations of Americans have struggled since the 1950’s to maintain and lose weight despite eating less and exercising more. The equation of “calories in/calories out” simply does not work when the entire fat burning and storage mechanisms in the body is changed by the foods we eat. Are You On The Weight Loss Roller Coaster? You are not alone if you were easily able to maintain your weight in your 20’s, then it gets harder and harder despite the same efforts as you age. Starting in a person’s 30’s, how they were able to eat and move in their teens and 20’s catches up. The same tactics no longer produce the same results. Eating less, and exercising more results in fatigue, hunger, little or not weight loss. For many women, eating less and exercising more actually produced weight gain. This can be very disorienting and emotionally draining. Then by the time a person reaches their 40’s and 50’s, chronic/systemic inflammation has set in and other health issues are developing. Low energy, stubborn weight, and aches and pains associated with “normal aging” is not normal in our opinion, but rather signs of insulin resistance, leptin resistance, and chronic inflammation. These hormone imbalances are related to eating foods that cause fat storage which further disrupt hormones that help to stay a normal weight. The way we do weight loss in Johnson County KS gets you off the weight loss roller coaster and onto a simple, sustainable path for health and weight maintenance. If you feel like you have “tried it all” and find yourself missing out on life, frustrated with your weight and low on energy, we can help. We are different than the most popular weight loss programs because they have two inherent flaws that keep you from long term weight loss, mental clarity and improved energy. They use pre-packaged artificial foods with no regard to how the quality of food affects hormone balance or body chemistry. These programs use a moderate amount of poor quality carbohydrate foods which increases fat storing hormones and suppresses fat burning hormones. LifeWorks Integrative Health always puts your long term health at the forefront of anything we do. We are not interested in quick fixes that do not last or cause metabolic damage. We are interested in results that get you to your health goals. This is why our Metabolic Reset program restores insulin sensitivity and retrains your body to use stored fat as fuel while fully nourishing you with quality foods. Too many people are eating foods that fill them up but do not fuel or nourish them. Not only do we aim to fuel your body for the life you want, but also to shift the way your body uses food for fuel. Get on the right path for weight loss in Johnson County KS to improve your metabolic health, weight loss and energy. Join us to learn more.